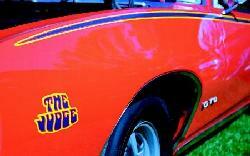 3- Judge decals for each fender and trunk lid. Photo to help in location of stripes. NOTE: Each kit is manufactured on 3M material and is recreated from original GM NOS stripes for color matches and size. New reproduction stripe kits in the correct color combinations for 1969 Judge models. Our stripes are cut from 3M vinyl film (same as the originals). Of course you could find an N.O.S. stripe still in the original packaging, but remember…GM hasn’t produced Judge stripes for several years! Even when stored in the best environmental conditions, both the adhesive and vinyl material will deteriorate making installation extremely difficult if not impossible. Our stripes duplicate the originals with clear pre-mask and brown backing paper. All stripes are installed like the original. These are the highest quality Judge stripes on the market today…don’t settle for anything less! Fender/Spoiler Decals Note: Colors in capitals indicate the predominant color of the decal. 1906921 1969 – Yellow/Red/BLUE pattern NOTE: The Blue is a dark color. 1906924 1969 – Yellow/Red/BLACK pattern NOTE: February & later built models use this color. Did you know our licensed by GM All colors are screen printed with color matches based on NOS GM decals & UV protected. The same applies to the stripes we offer for the 1969 Judge printed on 3M material. Did you know the part numbers used below were the original GM part numbers they used when they were available. 1968-72 Brushed Aluminum plate with blue background. Great addition to any car.